Spreading the love a bit more with a giveaway for my local friends. 1. "Like" Monika McSweeney Photography on Facebook. 2. Tell me how you spread the love during the holidays! 3. For an extra entry, follow Monika McSweeney Photography on Pinterest. Leave a comment for each task, which gives you three chances of winning!Please leave your email address along with your comments, otherwise I don't have any way to contact you in case you win. And if you're already a fan on Facebook and/or follow me on Pinterest, just say so in a comment. Giveaway closes on December 17th at midnight PST. 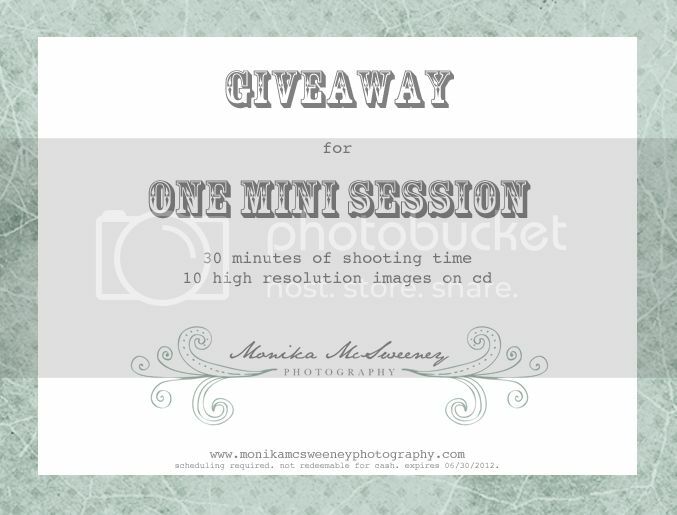 Winner will be announced on my blog December 18th. and I am following you on pinterest!!! I signed up on Pinterest. How fun would it be to do a photo shoot of Kaymbria & Macey...You rock my friend!!! Was already a FB fan. Following on Pinterest now. We spread the love during the holidays by donating clothes to a family in need. We also donate food to our local shelter and give a toy to Toys For Tots. I already like you on FB, just followed you on Pinterest (and of course got sidetracked and started browing). During the holidays we do Operation Christmas Child, adopt a local family with my women's bible study, as well as Operation Merry Christmas. Thank you for doing this! We spread Xmas joy by donating food and toys to needy families! This year we filled shoeboxes for Operation Christmas Child. The kids loved picking out toys and personal items for children who otherwise wouldn't get anything for Christmas. We also got together with some friends and adopted a family from the Angel Tree. We have done Operation Christmas Child for the last 10 years and is something my kids LOVE doing! I'm so glad to see so many other families doing OC!! :) We also buy a bunch of gifts that our kids want for Christmas and donate them to a shelter. Lots of extra volunteering at my daughter's school with all the parties, musical's...oh and after Kiarra opens her gifts, we go through all of her old toys and decide which ones she wants to donate. Thanks!!!!!! fingers crossed, I love your session!!!!!! Spreading the christmas cheer around this year I been more about small little things. Like making paper christmas trees for the lobby at the food bank next to work. Inviting people without family near by to the holidays. Money has been tight so I just try to bring the spirt of the holidays to people with a smile and a helping hand. I already "liked" you on fb. Spreading cheer by doing lots of volunteering, donating, toys for tots and buying animals through World Vision. Okay Monika, I already liked you on Facebook and your Pinterest has a waitlist, (never heard of that). Throughout the year, we spread love by actively participating in fundraisers through the school, kids sports, church and can donations for the needy. Kids give their clothes, and toys to those in need too! I think a great way to spread love this holiday season is to go caroling (which we are doing next week) and share the Christmas spirit with others.